Facebook. Just over 11 years ago if someone had said Facebook to you, you might scrunch your face and say, what? However, today Facebook is the largest social networking system in the world! If you were to ask most people you know or were to meet, they would say they are on Facebook. Originally Facebook began as “Facemash” where you could compare two different faces and make comments about them. Then there is the creator of Facebook, Mark Zuckerberg, who went from Harvard University student, to CEO of one of the richest companies in the world. In May of 2012, Facebook went public selling shares of the company in an IPO/Initial Public Offering. The sale of shares raised over 16 billion dollars, making it the third largest IPO in the history of the United States. At any given time this is how many Facebook users are online accessing their Facebook page and viewing posts. And from the looks of things, there are a lot of people actively using Facebook! In just one (1) second there are 20,000 people on Facebook. Facebook averages around 10,000 to 20,000 users a second! Amazing. In just 18 minutes there are 11,000,000 active users on Facebook. 11 million! Mobile Users: Let us not forget that in this day and age, many Facebook users are accessing their Facebook page and viewing posts via their mobile, and using the Facebook app. On average 79% of all active Facebook users are accessing Facebook via their mobile. If that doesn’t support an application, I am unsure what would. On average, there are 486,183 users on Facebook, via their mobiles every minute! This is how many people are just now signing-up for Facebook. Funny, I thought everyone already had signed-up, but apparently there still are those out there that are not Facebooked yet. In 15 minutes Facebook has had 7,246 people sign-up as new users. That’s eight (8) new users a second. Here is where we see the power of the social network! In just a short period of time hundreds of thousands of messages are sent to other users. In a second anywhere between 2,500 and 5,000 messages are sent. In just a minute almost 150,000 messages are sent! Communication is power, and people on Facebook are communicating! Maybe you found a long lost school mate on Facebook and want to catch up on what’s been happening, you send a Friends Request to them. This is also where the social network gets even more social. Locating old friends, connecting with those in your circle of friends, or your family in other parts of the country or world. You send a Friends Request and they can become part of your Facebook social group. With so many people using Facebook, and new ones joining, you can imagine that there would be plenty of Friends Requests. In 10 minutes, there are over 100,000 people being requested to be a friend on Facebook. That is over 1,500 a minute, or over 166 a second! If the number of users and messages were not staggering enough, the number of posts on Facebook will blow your mind! In just 15 minutes there will be over 49,433,000 new postings on Facebook. That’s over 49 million! That averages out to over 3 million posts per minute, or over 54,000 per second. Astounding! In just a short period of time thousands and thousands of people are changing their Facebook Status. This is where you state your status is single, married, in a relationship, etc. I wonder how many are changing their status from Single to In a Relationship, or from Married to Single. We might be able to find some statistics on divorce and broken relationships from this. In 30 minutes over 850,000 updated their status on Facebook. That is over 28,000 per minute, or almost 500 per second. I also wonder how many of those status updates go from single to in a relationship, and then back to single in just a short period of time?? Like something someone has posted on Facebook, tell them so with a “Like” post. With all the posting and messaging, there has to be plenty of likes as well. In just a second, over 52,000 liked something on Facebook and let it be known. In 30 seconds there were over 150,000 Facebook likes. And there were more than 500,000 likes in just a minute. Money talks, or in the example of Facebook, money talks loudly. In 30 minutes Facebook’s ad revenues total almost $700,000! The total revenue is around $750,000 for the same time period. This means that Facebook’s total revenue is around $416 per second. Have some family photos you want to share, upload them to Facebook. Want the world to see what you are having for a meal in a restaurant, take a photo on your mobile and upload it to Facebook. Then see if anyone gives it a “like”. The ability to upload photos so everyone can view them, and the access your friends will have to view them is amazing. On average over 4,000 photos are uploaded to Facebook each second! That’s over 240,000 a minute. I wonder how many of those were selfies? As we communicate through messages and postings and uploading photos, there is a lot of shared content on Facebook. 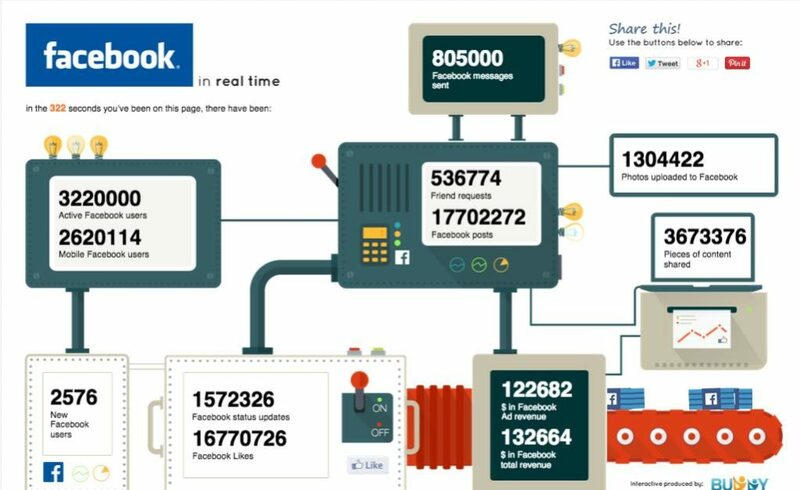 In fact there is over 1.3 million pieces of shared content on Facebook per minute! That’s almost 23,000 pieces per second. We are a generous bunch on Facebook. Facebook in real time, the numbers are massive, and show that as people we are very social, and as social networks go, Facebook is number 1! This infographic is provided by Buddy Loans.